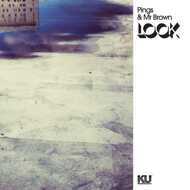 'Look' is a 6 track instrumental project by Pings & Mr Brown. All the tracks have been created by sampling a multitude of cover versions of a well-known song from the late 60’s. The initial idea for the project came about when the two producers over the years exchanged beats they had created from different versions of the song. This resulted in a perfect concept for a record.